Turf Treatment: Grubs! | Bowman's Pro Turf, LLC. One of the most destructive insects that can infest your lawn is the white grub. If not properly controlled, severe damage can occur in a very short amount of time. To understand the grub, we need to understand their life cycle. The grub is the larva stage of several species of beetles, including Japanese beetles. Summer- Beetles will feed on common ornamental plants, trees, and grasses. In doing so, they will lay eggs. The eggs protect the new insect from the environment until they hatch. Fall- The newly hatched larva begin feeding on the root system of the turf. The damage will cause the turf to quickly deteriorate. The symptoms can include sod that can be easily pulled up, almost like rolling up a rug. Occasionally, animals such as raccoons or skunks will forage the turf for the grubs and cause additional damage. Winter- As cold weather takes over, the grubs move to deeper soil and overwinter. This is similar to a hibernation stage for the grub. 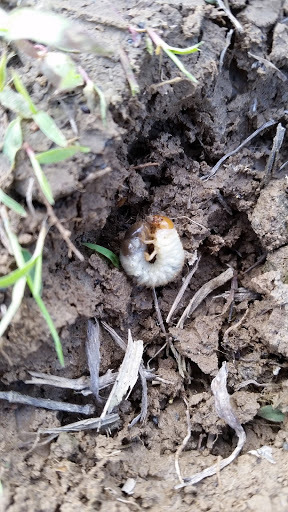 Spring- Temperature rises and the grubs begin to move back towards the surface. They undergo several changes from the larva to pupa. In late spring and early summer the adult will finally emerge as a beetle. As with just about everything, it is always better to be proactive and not reactive! If an insecticide is applied when damage is occurring, it is usually too late. Our grub preventative program utilizes a product with imidacloprid to provide the best results. Because of the life cycle of the grub, the product does not have an impact when the insect is in the egg stage. Once the egg hatches, the grub will ingest the imidaclorprid and die. An application in spring will ensure that the newly hatched larva in the summer are impacted by the application. Treatments-The chemistry behind the products that we use today is different than the products of the past. I have been asked before “Doesn’t it take 3 years for the grub control to work?” With applications such as milky spore, it would. However, the application we apply this spring will work this year! Moles- Probably 9 out of 10 requests for grub control stems from the thought that it will get rid of moles. We do not sell a grub control with the side effect of treating moles. 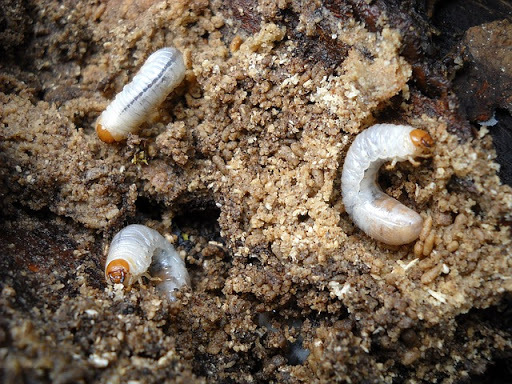 Grub treatments will get rid of the grubs, but we do not guarantee the elimination of anything else. Japanese Beetle Traps- I have been asked about the yellow Japanese beetle traps or bags and if they work. One main problem with these traps is that it attracts beetles to it. When the beetles are attracted, they will lay eggs. This will cause a problem with future grub damage. If you insist on using a Japanese beetle trap, the best place to put it is in your neighbors lawn. Since that likely is not an option, the far back corner of your property away from ornamental plants, trees, and high traffic areas would be better. Brown Spots- Far too often we will meet with potential customers and they will tell us that “XYZ Lawn Care” said we needed grub control because we have brown spots. Brown spots do not instantly mean you have grubs. If a company tries to sell you something over the phone by just looking at a satellite image, be very cautious. A brown spot can be a result of hundreds of factors, not just grubs. Grubs and other common Indiana insects can cause a lot of destruction to your lawn. Unfortunately, they tend to migrate towards the healthiest lawns to feed on. A well maintained lawn with a strong root system can in turn cause become a smorgasbord for feeding insects. It is important to properly identify what symptoms your lawn has and determine the desired solution with realistic expectations. We will never sell anything over the phone or just by looking at a picture. The only thing we use satellite images for is to measure a property. Visual inspections are required for us to adequately asses each customers needs and find the best solutions. We would love to hear back from you! Leave comments below or write us on our Facebook page. We also have a new website! Be sure follow us on Instagram and Twitter! ← "Why do I have weeds?"